How to get to dreamOlé 18? Time really flies! it seems like it was yesterday when we had such a great time at dreamOlé 17, and we are just so close to dreamOlé 18. We are pretty sure you’ve already bought, or are about to buy your ticket, so we wanted to let you know about the options you have to get from your home to this year’s venue. We have all the details so that you don’t have to worry! The fact is that we are a team strategically distributed all over Spain (we even have ambassadors abroad), therefore we have decided to collect the options that ourselves are considering to get to Barcelona. As usually happens, there is not “the best option” but it depends on your preferences, economy, etc, besides we may have not considered using some transport you might have thought of. You have several options because both cities are very well connected. 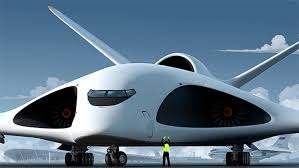 If you are a traveller with high flights but you have the private jet in the workshop, you might want to choose any of the flights that connect Madrid to Barcelona. Our advice is that you use skyscanner so that you avoid searching over the websites of all the airlines that have connections between the two biggest cities in the country. But if flying is not your thing, you can use other options, like the train, the bus or a private car. 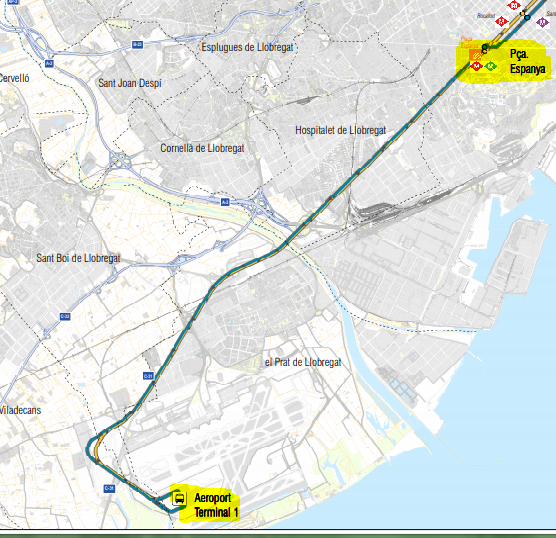 It is a fact that AVE (High Speed Train) is not as fast as the plane, but it will get you closer to dreamOlé: this year’s venue is just 10 minutes away from Sants train station (more details below). If you don’t mind getting up early, you can catch the first train in the morning and travel the same day of the event, otherwise you will need to travel on Thursday, which will allow you to enjoy Thursday night in the “Condal City”. It’s probably the most economic option, but also the slowest: almost 8 hours long, best case. Alsa’s buses end most trips at Sants station (just as AVE, High Speed Train), but some end in Nord station. If you can, choose the option that ends in Sants train station, which is the one just next to the venue where dreamOlé happens. You need to know that from Madrid city center to the venue there are about 600 km. The shortest route is through the A-2/AP-2 motorway (where you need to pay toll in Zaragoza), but you can save the toll fees when you get to Catalunya if you get out of the AP-2 and get to the A-2 route. To do so you need to leave the AP-2 in the “Salida 5 (Soses/Alcarràs)”, where you will have to pay for the last toll, and from there it will be free up to Barcelona. If you come from the “txirimiri” country (rain that does not get you wet, but fresh, just a bit of a drizzle) looking for a bit of spring sun…. 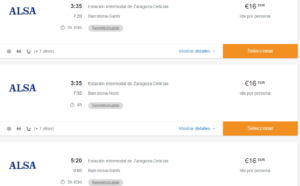 Same story, again this is the fastest option (1h 10 min plus 30 min extra from the Airport to Plaza España). 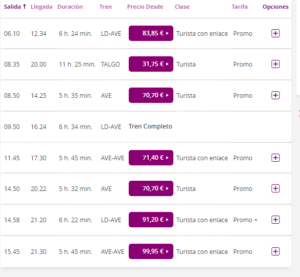 Flights available from 60€. 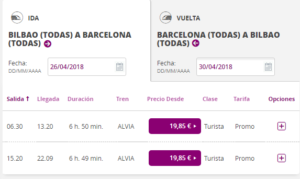 You can take an Alvia train, which takes about 7 hours to get to Barcelona, so you would have no option but to travel on Thursday 26th April. You will get to Sants train station, where you can catch metro line 3 (green color in the map) and in just 2 stopovers you’ll be in Plaza España and in dreamOlé! Bus is the slowest option, and not always the cheapest one, but it takes about 8 hours to get to the hotel. Remember to choose the bus option that gets you to Sants Station, which is the closest to dreamOlé, again, you should book with Alsa. If you live in Bilbao, tolls are no longer a secret for you and bad news is AP-68 and AP-2 highways are not cheap. If you want to save some Euros, just as we proposed from Madrid, when you get to Catalunya get the Exit number 5 and take the A-2 highway where you will go free up to Barcelona. Full trip is around 600 kms. 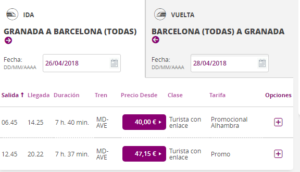 If you come from the South (your Andalusian humor will be more than welcome in Barcelona) the best options are plane or train, unless you feel like doing a road trip by car or taking a bus for veeery long hours. It will save you a couple of hours (and far way more relaxed) if you come by train rather than by car, or even more by bus. The counterpart is that it might take you long hours too so you need to travel the day before. By far is the worst option, as it will take you 14 hours to get to Barcelona. The route is about 850 kms using the AP-7 highway which drives all over the East coast of Spain (Levante). This year dreamOlé is a bit further for you guys coming from Seville, but plane and train are still the best options. Not a bad idea to catch AVE (High Speed Train), where you can be in Barcelona in about 5.30 hours, and you take it easy enjoying the trip. Last minute tickets are not a good idea, since some of the trains are already full! Well… that’s up to you if you don’t mind spending between 14 or 16 hours in a bus…. Do you like driving? then that option is right for you! “Mañicos” (that’s what people from Zaragoza call each other in a friendly way) are lucky this year, because dreamOlé is really close to you this year again! It’s only 300 kms from “la Pilarica” (the Cathedral in Zaragoza) from dreamOlé, so driving a car or riding a bike is not a bad option. 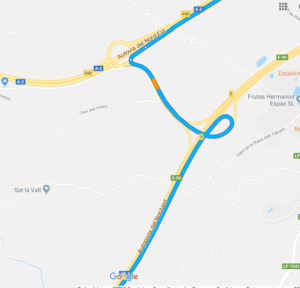 You would be joining “madrileños” and “bilbainos” in the last part of their route, you’d be coming on the AP-2 motorway, so the same toll applies and you could use the same option to avoid some of the last toll roads using exit 5 as explained above these lines. The quickest way is to fly from London, and you will find loads of different options from any of the London airports to Barcelona, you could even consider the option of flying to our neighbour city Girona, where you can then take an AVE train to Barcelona. Agin, Skyscanner will give you all the combinations for your preferred travel times. 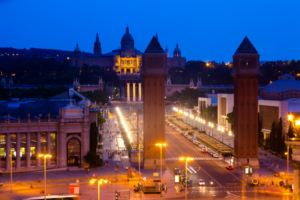 If flying is not your thing, or you simply want to split your trip to dreamOlé ’18, you could try getting to Barcelona by train all the way from London, it is doable and you will need at least 10 hours to get your feet on the ground in Barcelona. So, what should I do once I’m in Barcelona? Public transport! We cannot suggest anything else but public transport. We need to contribute to having sustainable cities, and Barcelona offers lots of different mobility options. Depending on how you got to Barcelona, you’ll be needing different indications to get to dreamOlé. 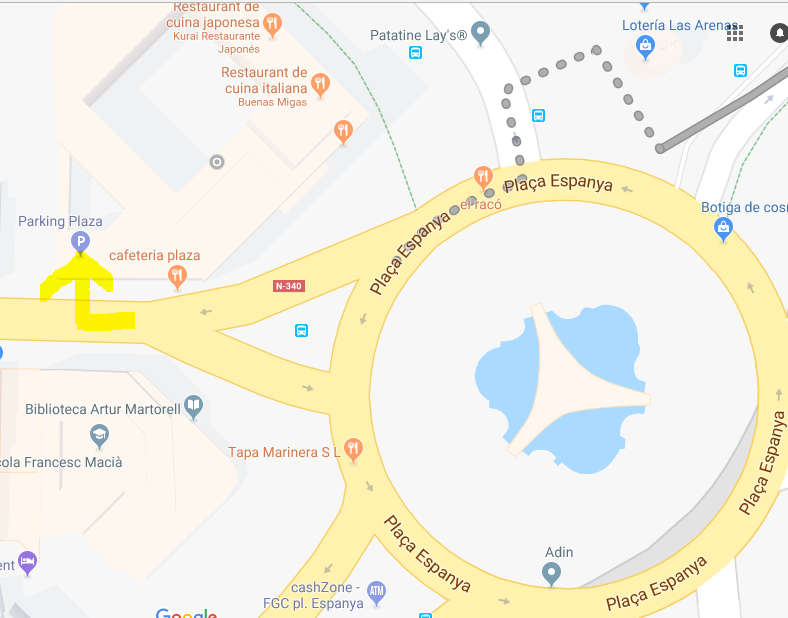 Barcelona airport is about 15 km away from Plaza de España; if you take a taxi and traffic is not very heavy, it can take about 20 minutes to get to us. Another option would be to take the airport bus: A1 (Aerobús) takes you from T1 straight to Plaza de España, there is a bus every 5 minutes, and it also takes about 20 minutes to get you to our doorstep. 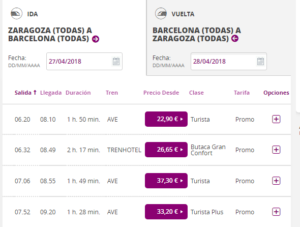 If you chose the short distance train (called Rodalies in Catalonia), you could be waiting for a bit, as the trains have a frequency of 30 minutes. But once you are in the train, it’s only 15b minutes to Sants train station, where you can take line 3 of Metro, just 2 stops away from Plaza de España. If you get to Barcelona by train, you’ll arrive to Sants train station; so all you need to do is take line 3 of Metro and stop at Plaza de España 2 stops after the train station. If your bus arrives to Sants, that would be ideal, as you can take Metro line 3 from there to Plaza de España. If that’s not an option and you arrive to “Estació del Nord”, you need to take Metro line 2 (the red one) from “Arc de triomf” and exit after 5 stops in Plaza de España, about 20 minutes later. If you ride your bike, you could probably park your motorbike outside the hotel. If you drive your car, you should use the hotel parking, as this is quite a difficult area to find on street parking.